It’s no secret that we are moving more and more into a world that will have smart everything. We already have smart phones and smart TVs, and so many feats of technology that weren’t even imagined a generation ago. Google glass is closer to being available to everyone. We can literally get all the information we need, we can work, and we can use our phones for just about anything. It’s almost an absolute truth that we are literally one with our devices. One man in Essen, Germany, a biohacker by the name of Tim Cannon took steps to actually become one with his. Sort of. He’s definitely headed that way, it seems. He placed a small computer and a battery in his own arm. On his own, without the assurance of a physician. Tim is a software developer from America. He’s an entrepreneur and biohacker and the COO of Grindhouse Wetware. He has had several body modifications in the form of technological implants. Some members of the press call him a cyborg. One example is the magnets he had put into his fingertips so he could feel electromagnetism with the extra sense that they lend. These minor surgical procedures can’t be done by doctors due to the rules physicians must abide by, so they are DIY or performed by modification pros. Tim travels the world speaking about futurism and the ways we can use technology to obtain the enhancement of all humans. Tim Cannon founded his company, Grindhouse Wetware in Pittsburgh, Pennsylvania in 2012. His goal was to use the biohacker idea to explore ways to augment the capabilities of human intelligence. He is attempting to bring transhumanism to the forefront of our consciousness. Not quite sure what that even means? Transhumanism is the belief that we can make our lives, as humans, better with the use of technology. There is a movement surrounding the idea that is cultural and intellectual in nature. It is believed that we should be reaching to obtain better heights through the use of ever expanding technological practices and applications. This includes cloning, nanotechnology, and genetic engineering. The belief is that with these and other growing technologies, we might achieve immortality. Transhumanists are studying and testing out ever growing feats of technology that can help us improve the physical, psychological, and intellectual parameters to stretch humans farther than we ever dreamed possible. Some forms of this have already been utilized by the U.S. military in the training of snipers. tDCS, or transcranial direct current stimulation sends a very low electrical current through the brain. This helps make reaction times faster and helps people learn faster. Sounds like science fiction a bit, doesn’t it? More extreme examples of transhumanism go to the realms of uploading someone’s mind to a computer, and the fact that there will probably be computers that are more intelligent than humans. Tim is not the first one to try something like this. There was a guy who used magnetic headphones, and another man stored a gif that was animated in an RFID chip in his own hand. Tim upped the ante by going much further than anyone else has before. 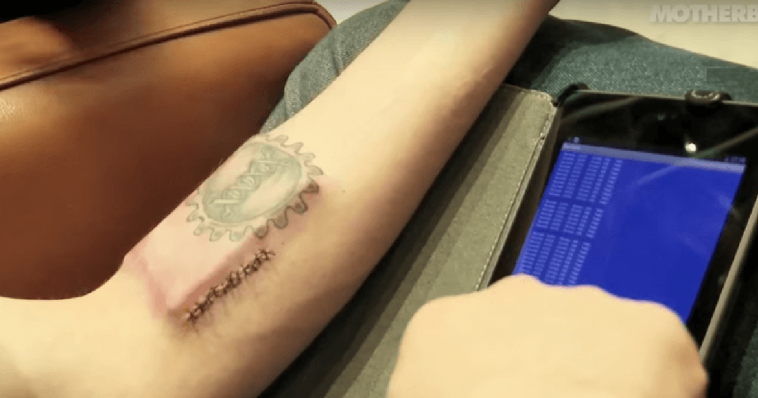 He encased the computer chip in silicone that is medical grade, and a battery that is able to charge wirelessly, and embedded them into his forearm. It is very noticeable. He won’t be able to hide it from anyone as long as his arm is showing. He got the help of Steve Haworth, a body modification professional to put the contraption under his skin. All without any anesthesia. Cannon owns the company Grindhouse Wetware, who built the implant. The subdermal device is called Circadia 1.0. This device is able to keep track of Tim’s biometric information and can send it to Android devices. The Circadian data is able to be operated in whichever way the owner desires, as it is an open source gadget. Right now, Circadian determines basic body biometrics, body temperature and the like. It reads the data and sends it in real time using Bluetooth technology. There are LED lights as well used to light up the device under skin and to display the status of the device. Improvements and features are already in the process of being added, by Grindhouse along with Cannon. They’ve added a pulse monitoring feature and are working towards automatic communication between the Circadian and any device paired with it. If it seems a little big to you from the picture, no worries, the size has already been reduced in hopes that more people will consider getting their own Circadian 1.0. Grindhouse worked on developing the device for the last two and a half years and in just a few months they anticipate having them ready for consumers to the time of $500. The body mod pro, Haworth said he will charge $200 to plant them under your flesh. So for $700, you can have your very own cutting edge product. The little bit Circadian can do might not seem worth it to you, yet. It doesn’t do very much and it’s expensive. Not to mention the fact that minor surgery is required to use it. It all has to begin somewhere. One day in the near future, you just might find yourself contemplating it.